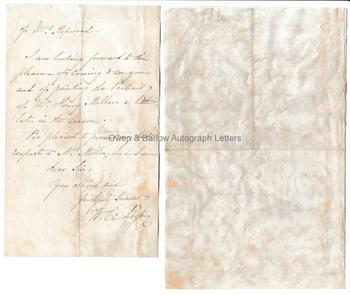 WILLIAM CHARLES ROSS Autograph Letter Signed & Autograph Letter. Sir William Charles Ross RA. Anglo-Scottish painter, particularly of miniatures. ALS. 2pp. Fitzroy Square. 3rd August 1955 and AL. 2pp. Hotel de Lille et d'Albion, Paris. November 17th 1855. 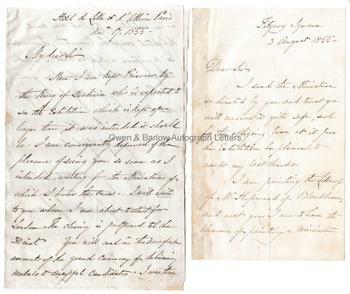 Both letters to "Dear Sir" [almost certainly Thomas Miller]. The first letter: "I send the miniature as directed by you and trust you will receive it quite safe, and for the obliging loan of it for the exhibition be pleased to accept my best thanks. I am painting the likeness of Mr Hopwood of Blackburne [sic], and next year I am to have the pleasure of painting a miniature of Mrs Hopwood. I am looking forward to the pleasure of coming to see you and of painting the portrait of Mr Henry Miller a little later in the season. Be pleased to present my best respects to Mrs Miller, and I am, dear Sir, your obedient and faithful servant, H.C. Ross." 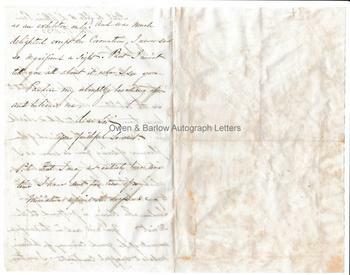 The second letter: "Here I am kept prisoner by the King of Sardinia who is expected to see the Exhibition which is kept open longer than it was intended it should	be. I am consequently deprived of the pleasure of seeing you so soon as I intended, waiting for the miniatures of which I have the care. I will write to you when I am about to start for London. The closing is postponed till the 30th inst. You will read in the newspapers account of the grand ceremony of delivering medals to successful candidates. I was there as an exhibitor only, and was much delighted . . .(?) the Coronation, I never saw so magnificent a sight. But I must tell you all about it when I see you. Pardon my abruptly breaking off and believe me, dear Sir, your faithful servant. P.S. That I may not entirely lose my time I have sent for two of my miniatures to paint the dresses, etc." The first letter: 18.5 x 11 cms (7.25 x 4.5 inches) Some browning, lacking integral blank leaf of the bifolium. Very good. The second letter: bifolium 20.5 x 13 cms (8 x 5.25 inches), slight browning, some mounting traces to verso of blank leaf. Very good. Provenance: From the 19th century album of Emma Marshall of Penwortham Lodge, Preston. Emma was the daughter of William Marshall, landowner and cotton manufacturer and was related by marriage to the Miller family of Baronets, M.P.s and landowners. Thomas Miller, to whom these letters are probably addressed was a keen art collector and was the purchaser of Millais' 'The Peace Concluded' and other works.